As any sports fan will tell you, it’s not who wins the first encounter that matters, it’s who wins the rematch. In December 2017, the New England Patriots beat the New York Giants in a close game to end the regular season that has pretty much disappeared into the NFL annals. One month later, the rematch occurred in Super Bowl 42, and that’s the game everyone remembers. In 1971, Joe Frazier beat Muhammed Ali in what was dubbed “The Fight of the Century.” The century didn’t last too long, because the fight between the pair that became legendary was their third encounter, the “Thrilla in Manila,” which was the crowning achievement of Ali’s career. Staying on that same boxing theme but moving to the arena of the silver screen, Ryan Coogler and Sylvester Stallone dueled for control of the Rocky franchise in 2015, with Coogler emerging a clear winner in Creed. Three years later, a rematch of sorts occurs, but with Coogler limited to producer duties, Stallone wins, practically on a walkover, in the sequel Creed II. Unfortunately, it’s the franchise itself that suffered a setback. After the initial Rocky movie wowed the film world (and the Oscars) in 1976, Stallone pretty much seized creative control of the franchise, with one sequel following another with decreasing quality and, eventually, box office. And, with Stallone past the age where even he could pen a credible screenplay returning Rocky Balboa to the ring, the franchise seemed down for the count. That is, until Ryan Coogler turned it inside out by placing the emphasis on a new generation of fighter in the person of Adonis Creed, son of Rocky’s long-time foe-turned-friend Apollo Creed. 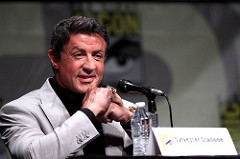 Under Coogler’s eye, Stallone gave his most disciplined performance in years in a diminished role that allowed Michael B. Jordan to seize the spotlight in the title role. This time around, Stallone is firmly back in control, co-writing the screenplay of Creed II and commanding more on-screen attention. The new director, relatively inexperienced Steven Caple Jr., clearly met with Stallone’s approval, and the script essentially dusts off the screenplay of Rocky IV, the most by-the-numbers effort of the entire franchise. But, while Rocky IV may have been by the numbers, it introduced Rocky’s most fearsome opponent, the Soviet Union’s robotic fighting machine Ivan Drago (Dolph Lundgren), who killed Apollo Creed in the ring during the movie. Not surprisingly, Drago’s rivalry with Rocky and the Creed family is the foundation of the plot of Creed II. At the start of Creed II, Adonis Creed wins the world heavyweight championship and proposes to longtime girlfriend, Bianca (Tessa Thompson). All seems well with the world, until Buddy Marcelle (Russell Hornsby), a hustling promoter, starts touting a potential match between Adonis and Viktor Drago (Florian Munteanu), son of Ivan. Despite Rocky’s warnings, Adonis allows himself to be goaded into the fight. As Rocky remains at home, Viktor beats the daylights out of a poorly prepared Adonis, breaking several of the champ’s ribs before Adonis wins the fight on a disqualification. After Adonis recovers, he reconciles with Rocky, and the two engage in some heavy training in the desert before traveling to Moscow, where Buddy insists that the rematch is held (and where the climactic fight in Rocky IV took place). Credibility, never particularly high in Rocky movies, is notably lacking in Creed II. Adonis completely abandons any semblance of common sense he had and reacts like a teenage hothead simply because the plot demands it. After the first fight, he retreats into a shell for the same reason, so that Rocky and Bianca can pull on his emotional heartstrings to get him back in the mood to fight. The fights themselves are very predictable, for anyone who has seen any Rocky movie, with the first match practically a blow-by-blow recreation of Apollo’s fight with Ivan, minus the fatal ending. What made the original Creed so successful was its distinctiveness as a movie about a black boxer from a rough background whose struggles to succeed, and the specific obstacles he overcame, seemed very authentic. In Creed II, that ethnic element is dimmed considerably, in all probability because Sylvester Stallone was responsible for the screenplay, and he was unable to introduce any non-boxing plot complications that seemed to fit the character of Adonis from the first film. We do get complications, but they are quite generic, and, moreover, Rocky’s problems appear to get more screen time than do those of Adonis. So, Adonis and Bianca worry about whether their new daughter will be deaf and, if so, how they will cope with it. That’s certainly a serious problem, but it seems to be pulled straight out of the generic medical problem storybook (much like Rocky’s bout with cancer in the first Creed movie). And deafness issues pale in comparison with Rocky’s on-again, off-again, on-again attempts to reach out to his long-estranged son. 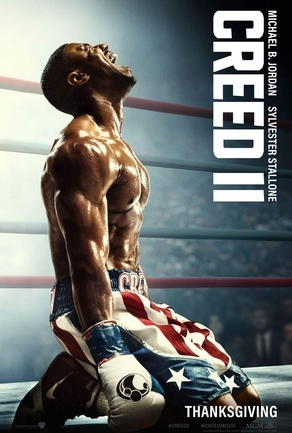 Although Creed II lacks much originality or creativity, it does share something else with the other films in the Rocky franchise; its action sequences are well staged. The two fights between Adonis and Viktor are shown at length and manage to be quite exciting, even though the audience knows pretty much exactly what is going to happen each time. Creed II has a new cinematographer, Kramer Morgenthau, and his work on both the fight scenes and the extended outdoor training scenes is excellent. Creed II also offers some solid acting performances. Although Sylvester Stallone mumbles and shuffles his way along, Michael B. Jordan makes the best of a character placed in some ridiculous situations by the screenplay. His Adonis has excellent chemistry with both Stallone and Tessa Thompson. The real acting surprise here, though, is Dolph Lundgren, who gives probably his best career performance (although his resume isn’t the world’s greatest). The best aspect of the screenplay is turning the Dragos into real characters with tragic backstories instead of just leaving them as cartoonish villains straight out of professional wrestling. Another villain from Rocky IV, Brigitte Nielsen as Ivan’s wife Ludmilla, also shows up for a brief but memorable cameo. No matter what one might think of Sylvester Stallone as a filmmaker, he does know how to craft crowd-pleasing boxing films ever since the original Rocky, even though every movie in the franchise since then has been highly derivative, except for Creed. Now, absent Ryan Coogler’s considerable influence, Creed II fits right back in the Rocky mold. This time, however, the mix of the new elements Coogler introduced and the familiar formula, along with a very well chosen set of antagonists, makes for a film that is a solid, if extremely predictable, action film. Don’t look for any awards attention, but Creed II is still a winner via technical knockout. In this clip, Michael B. Jordan tells Sylvester Stallone he's taking the Drago fight.